Welcome week in the fall is the time of year when most new college students actively avoid getting hit in the face with objects of any sort to avoid the potential for a nickname that will stick with them throughout their college career. This year, however, students who had been admitted to the University of California, Irvine, said, "Bring it on." 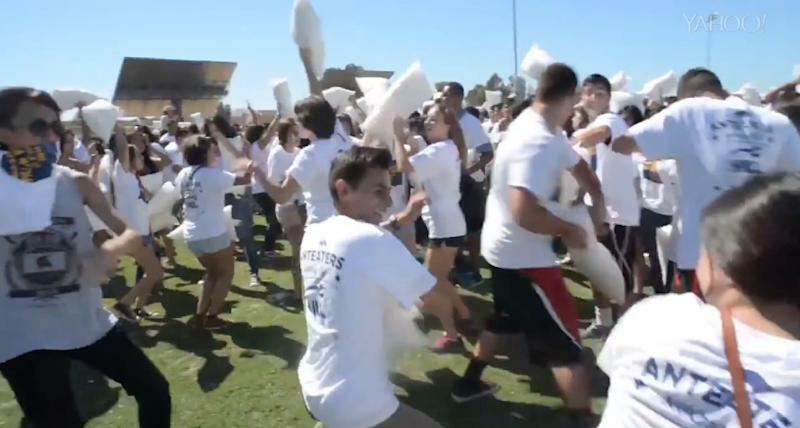 As part of the university's welcome week activities, UC Irvine students, mostly freshman and transfers, joined together yesterday to try to break the Guinness World Record for the world's largest pillow fight. An astonishing 4,200 (sober?) students succeeded in breaking the previous record — 3,813 people — held by Swedish DJ duo Dada Life, who instigated the pillow fight at a concert in Chicago. Although only one specific rule had to be followed in order to earn the record — the fight had to continue for at least 60 seconds — apparently a lot goes into organizing a world-record-breaking pillow fight. According to the Orange County Register, "It takes at least 100 volunteers and several turnstiles to count participants and an official Guinness adjudicator. Not to mention [portable restrooms], water, free food, and a disc jockey to keep everyone jazzed while folks file in." During the event, the students wielding the bed linens against one another were serenaded by Ariana Grande singing "Break Free." As with most pillow fights, a short dance party broke out after the students added their names to the history books. UC Irvine currently holds the records for the world's largest water-pistol fight and largest dodge-ball game, which were both set during past welcome-week celebrations. A fifth-year college student who had participated in the event described how it felt to break the world pillow-fighting record with one word: "Awesome." The Irvine Anteaters, as they are known, officially start class today, and we hope all their beds are made.